Matthew Apgar - mapgar@shawmedia.com Grass goes flying as Vinson May of Crystal Lake Central avoids a tackle by Prairie Ridge during their football game on Friday, September 11, 2015 at Crystal Lake Central in Crystal Lake. 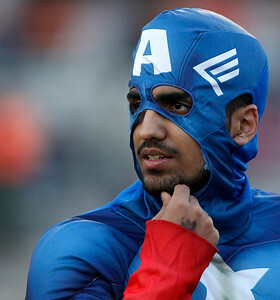 Matthew Apgar - mapgar@shawmedia.com Roshan Patadia of Crystal Lake Central looks out over the crowd while in a Captain America costume before the Tigers' football game against Prairie Ridge on Friday, September 11, 2015 at Crystal Lake Central in Crystal Lake. Both teams observed a moment of silence in remembrance of the 9/11 terrorism attacks. 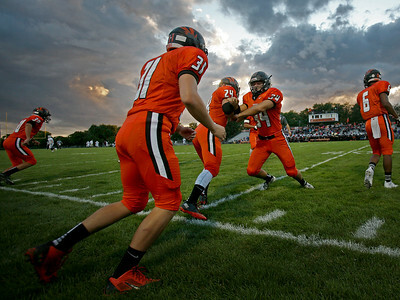 Matthew Apgar - mapgar@shawmedia.com Crystal Lake Central Tigers warm up on the field before their football game against Prairie Ridge on Friday, September 11, 2015 at Crystal Lake Central in Crystal Lake. Matthew Apgar - mapgar@shawmedia.com Prairie Ridge Wolves celebrate a touchdown by quarterback Samson Evans, right, during their football game against Crystal Lake Central on Friday, September 11, 2015 at Crystal Lake Central in Crystal Lake. Prairie Ridge won 42-7. Matthew Apgar - mapgar@shawmedia.com Crystal Lake Central's Brandon Dahl, right, hangs onto Prairie Ridge quarterback Samson Evans as Evans runs for a first down in the first half of their football game on Friday, September 11, 2015 at Crystal Lake Central in Crystal Lake. Prairie Ridge won 42-7. Matthew Apgar - mapgar@shawmedia.com Samson Evans, left, and Jeffrey Jenkins of Prairie Ridge jump in the air to celebrate a touchdown by Evans during the first half of their football game against Crystal Lake Central on Friday, September 11, 2015 at Crystal Lake Central in Crystal Lake. Prairie Ridge won 42-7. 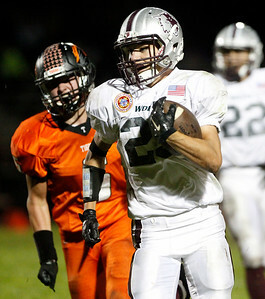 Matthew Apgar - mapgar@shawmedia.com Quarterback Samson Evans of Prairie Ridge carries the ball down the sideline for a touchdown in the second half of their football game against Crystal Lake Central on Friday, September 11, 2015 at Crystal Lake Central in Crystal Lake. Prairie Ridge won 42-7. 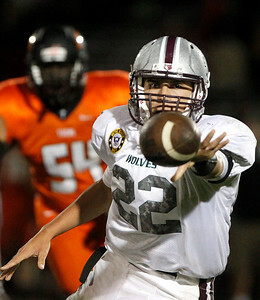 Matthew Apgar - mapgar@shawmedia.com Quarterback Samson Evans of Prairie Ridge claps as the Wolves overturn the ball late in the 4th quarter during their football game against Crystal Lake Central on Friday, September 11, 2015 at Crystal Lake Central in Crystal Lake. Prairie Ridge won 42-7. Matthew Apgar - mapgar@shawmedia.com Crystal Lake Central's Brandon Dahl, left, intercepts a long first half pass intended for Luke Annen of Prairie Ridge near the 5 yard line during their football game on Friday, September 11, 2015 at Crystal Lake Central in Crystal Lake. Prairie Ridge won 42-7. 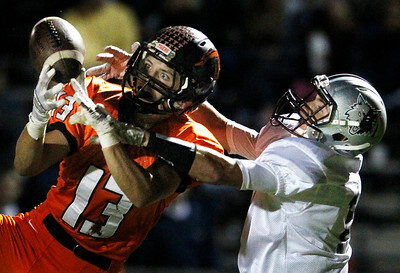 Matthew Apgar - mapgar@shawmedia.com Cole Brown of Prairie Ridge races downfield with the ball as Crystal Lake Central's Jeremy Hey tries to keep up during their football game on Friday, September 11, 2015 at Crystal Lake Central in Crystal Lake. Prairie Ridge won 42-7. Matthew Apgar - mapgar@shawmedia.com Crystal Lake Central's Vinson May is upended by Jacob Ommen of Prairie Ridge during their football game on Friday, September 11, 2015 at Crystal Lake Central in Crystal Lake. Prairie Ridge won 42-7. Matthew Apgar - mapgar@shawmedia.com Vinson May of Crystal Lake Central gets airborne as he trips over the leg of teammate Shawn Kyska, right, who cleared a path for May by blocking Matthew Henning of Prairie Ridge, bottom, during their football game on Friday, September 11, 2015 at Crystal Lake Central in Crystal Lake. Matthew Apgar - mapgar@shawmedia.com Quarterback Samson Evans of Prairie Ridge pitches the ball off to Cole Brown during their football game on Friday, September 11, 2015 at Crystal Lake Central in Crystal Lake. 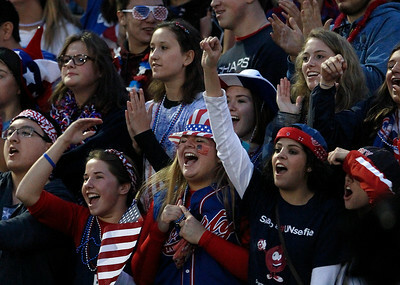 Matthew Apgar - mapgar@shawmedia.com Crystal Lake Central fans cheer on the Tigers during their football game against Prairie Ridge on Friday, September 11, 2015 at Crystal Lake Central in Crystal Lake. 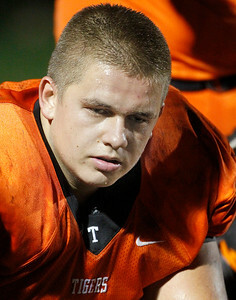 Matthew Apgar - mapgar@shawmedia.com Crystal Lake Central's Wyatt Blake kneels among his Tiger teammates during halftime of their football game against Prairie Ridge on Friday, September 11, 2015 at Crystal Lake Central in Crystal Lake. 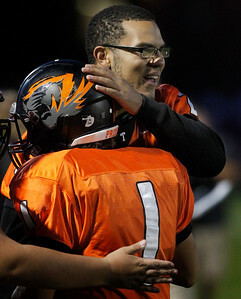 Matthew Apgar - mapgar@shawmedia.com Crystal Lake Central's Romeo McKnight, back, congratulates quarterback Shannon Madura after the Tigers scored a touchdown against Prairie Ridge during their football game on Friday, September 11, 2015 at Crystal Lake Central in Crystal Lake. 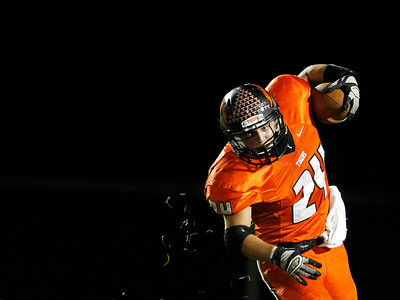 Matthew Apgar - mapgar@shawmedia.com Aaron Sances of Crystal Lake Central runs for a first down against Prairie Ridge during their football game on Friday, September 11, 2015 at Crystal Lake Central in Crystal Lake. Matthew Apgar - mapgar@shawmedia.com Vinson May of Crystal Lake Central, right, gets blocking help from teammate Shawn Kyska, left, who knocked down Matthew Henning of Prairie Ridge, bottom, during their football game on Friday, September 11, 2015 at Crystal Lake Central in Crystal Lake. 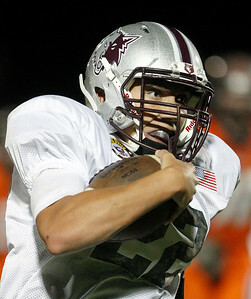 Quarterback Samson Evans of Prairie Ridge carries the ball down the sideline for a touchdown in the second half of their football game against Crystal Lake Central on Friday, September 11, 2015 at Crystal Lake Central in Crystal Lake. Prairie Ridge won 42-7.